Kung Hei Fat Choi, mga Choy! Welcome the Year of the Earth Dog! I don't have a single drop of Chinese blood in my veins but being in my China (with that, I refer to our local Chamber) for quite some time now, I've come to embrace some of their traditions already ( Wow, I belong! ❤) like celebrating the Chinese New Year- one of the biggest celebrations in the Chinese Culture. Each year has a specific Chinese Zodiac Animal and this year is the year of the Earth Dog. According to Know Feng Shui. com, each Zodiac Animal has a feng shui element associated to it which determines the quality of energy in the new year. Knowing which Zodiac animal you are born to also helps knowing if you are in tune with the energy of the universe. CLEAN YOUR HOME THOROUGHLY. 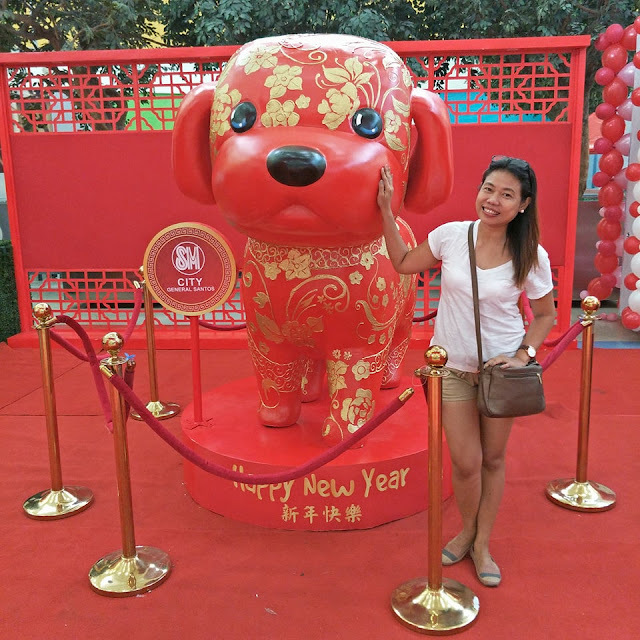 O, may ilang oras ka pa bago pumatak ang Chinese New Year which will officially start on February 16 this year, according to the Lunar calendar, this is to make sure that the feng shui energy in your home in clear. Therefor, peace and quite for your home. BUY A NEW DRESS. MAKE IT RED. Wow! A good excuse to shop for a new garb, hahahah!As with any occasion, the color one wears during the New Year celebration are considered important. Most Chinese people wear new clothes for the New Year celebration to honor the birth of new energy. Red and Gold are colors of happiness, longevity and prosperity so, there you go, Little Red Riding Hood! FISH BE WITH YOU! Fish in Cantonese sounds like "abundance" so dont forget to serve fish (steamed pompano, perhaps?) for the New Year's dinner. You can also serve noodles. The longer the noodles are, the better for you as this symbolizes long life. Get some sweet and sticky items like Tikoy, too. Para sweet and dikit-dikit lng ang life lng ang life. DONT SWEEP! Sweeping the floor on the first day of the CNY is like sweeping your luck away. So dont make kalat na lng para you wont need to walis the floor. NO TO LUGAW. Dont serve lugaw and meat for breakfast.Para siguro di kayo maglugaw sa buong taon!Or perhaps, para di lumabnaw ang swerte. SHOWER 🚿 NOT! Do not wash your hair and dont do the laundry yet so as not to wash the good fortune away. So ligo ka talaga the day before the CNY! The dog is said to be our bestfriend. People born in the year of the dog are said to be loyal, very talented and always easy to help.